If you’ve ever come across a file in your file system that when control-clicked gives you an option in the pop-up menu to Show Package Contents then you are familiar with the type of file we are looking to create. What you may not know, however, is that this file is actually a directory. The choice to show the package contents is the OS allowing you to treat the file as a folder, which it actually is behind the scenes. When you create a custom file format in this manner, you are simply storing your project data and files under a sub directory. You can verify that a special bit is set on these types of files by opening Terminal.app, navigating to the directory where such a file resides and running ls -al to get a detailed file list. When I do that on my directory where some of my custom files types are stored, I get a listing that looks like this. Where <directory_name> is the name of the directory on which you would like to set this bit. For this post, I’ve included a demo application I’ve named PDF Keeper. PDF Keeper isn’t terribly practical as an application, but it effectively demonstrates the principles I’m wanting to convey. It simply opens our custom file type and loads in properties and data specified in the Info.plist file that each custom file contains. When you first run the application, you will be prompted to create a new PDF Keeper file. 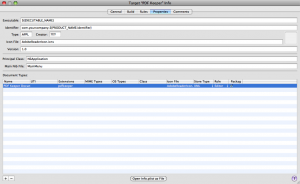 You will then see a list view that displays a list of PDF files stored within our custom file type. When you first create the file, the list veiw will be blank, so you will need to add some PDF files by selecting File | Add PDF File…. It then allows you to double-click any of the files in the list to view them in a PDFView. If you were to look at one of the PDF Keeper file contents by selecting Show Package Contents from the context menu in the finder, you would see file hierarchy similar to the one below. Note: Keep in mind that you will have different PDF files in the Resources directory than I have. The Info.plist file inside the Contents directory is a property list file in XML format that keeps track of the PDF files we are storing. The Resources directory is where all of the PDF files are actually stored when we add one in PDF Keeper. Download, build and run the demo application to see it in action. The path to your Info.plist file is important. It should be located inside of the Contents directory and be named Info.plist. That way, when we call, -[NSBundle bundleWithPath:], we will receive back an NSBundle whose infoDictionary member variable is an NSDictionary populated with the contents of the Info.plist file. You can see how we do this in the call to -setupProject. // and grab the array of files using the key "Files"
// If we have a list of files, we initialize our array model with them. This is probably the most tedious aspect of the custom file format task as you have to decide what data you want your file to contain. I suggest that you code up a sample property list file in xcode and manually edit it to represent what you want. Then you can tweak it as you go. You won’t think of everything you want to save at first, so you do this loosely, however, you do need to start somewhere. This property list file is what will be stored inside the Contents folder of your custom file. Here is what a Info.plist file looks like in a PDF Keeper custom file. This part is actually quite simple. You will, however, want to have your own custom icon ready to use for your custom format file. To register your file format, which is what enables you to double click your file in the Finder and have it properly load your application, with your project loaded in xcode, select Project | Edit Active Target “<Project Name>” where <Project Name> is the name of your project. In the ensuing window, select the Properties tab. You will see at the bottom a list view labeled Document Types:. This is where you will specify your document name, extension, and icon file. Below is a screenshot of the Document Type specified in PDF Keeper. Notice that the Package checkbox is checked. This is what tells Finder that your file, though a directory, should look like a single file to the end user. You should also make note that the file extension field does not have a dot (.) in it. I learned that one the hard way. Some applications that use this technique for custom file formats hide the file extension while others show it. Garageband, the entry level music recording application from Apple, for example, hides its file extension which is .band while our beloved xcode shows its file extension which is .xcodeproj. Hiding and showing file extensions is handled in the Finder through the Get Info… window. If you select a Garageband file in the finder and press Command-I you will notice under the Name & Extension section the Hide extension checkbox is checked. 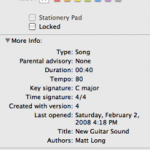 Here is a screenshot of a Garageband file’s Get Info… information. Note: If you don’t have any Garageband files to look at, just run the demo app, PDF Keeper and create a new file. You can then Get Info… by pressing Command-I with that file selected in the finder to see the same thing. You can do the same with an xcode project and you will notice that its Hide extension checkbox is not checked. If canSelectHiddenExtension is set to YES, the user would have the option to select/deselect a checkbox in the save file panel to show or hide the extension. 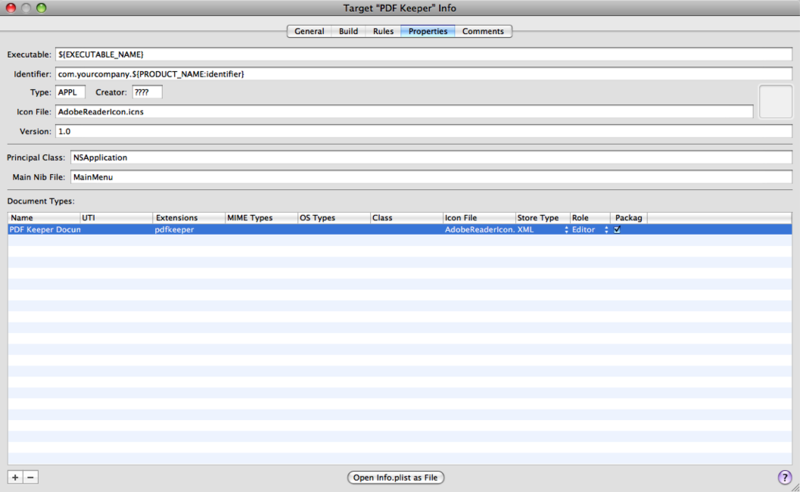 We simply hide it for PDF Keeper as it reduces confusion and makes it easier to manage everything behind the scenes. If treatsFilePackagesAsDirectories is set to YES, the file system would allow the user to drill down into the custom file as if it were a regular directory. We don’t want the user to be able to do that as we are treating the custom file as a normal file rather than a directory. You will likely want to enable your users to double click a file in the Finder that will then automatically load into your application. If you added a document type to your project as specified in the Register Your Custom File Format section above, then you are already part of the way there as on the first run of your application, the file/document type is automatically registered with the OS so that double clicks of your file type will be handed to your application without any further effort on your part. // This gets called when the user double-clicks a project file in the Finder. // This gets called when the user opens multiple files from the Finder. // We only take the first file. In the PDF Keeper demo application, we are only concerned with PDF files. When users select File | Add PDF File… they are prompted to select a PDF file that is then imported into the custom file type. This importing procedure is really just a simple file copy. Remember that our custom file is really just a directory that is being treated as a regular file by the OS. The file import just copies the file from the place where it was selected by the user into the Resources directory of our custom file. Here is the code to add a PDF file to our project file. // file path and the Contents/Resources path below it. // Add the filename to our list of files. // Set the path for our property list file. // If it already exists in the project, delete it. // Create a dictionary to use to write out our property list file. Your custom file format can be as simple or complex as you would like to make it. You simply decide on all of the information you would like to store in your Info.plist file and then create sub-directories under your Contents directory where you will store your data. The concepts are simple. You are storing data and information about the data inside of a directory that the filesystem treats as a single file. It’s a very elegant way to create and manage your own custom file formats. Until next time. I changed the package icon in my icon.icns, but I still see the old icon in the Finder on both packagest that were there before the change and new ones made after. How do I force the Finder to use a new package icon if/when I change it? Have you tried re-starting the Finder? That should do it. p.s. I asked Marcus. This was his suggestion. I don’t know how to restart the Finder :o so I did the next best thing and restarted the Mac. That seems to have worked. Thank you. I’m surprised this is the way to get updates to package icons to show up. If I change the application’s icon, I will see the new icon when I build and run the app. If I send an update to users (say via Sparkle), they’ll see the new app icon. I’m surprised that the only way they’d see an updated package icon is if they restarted the Finder. I don’t plan on changing icons a lot so it’s not a big issue, but sometimes for a huge update (say a major version), you might do this. By the way, great blog. Lots of great info. How i can update a plist file, for example add or delete an item from it and save it again. Load it into a dictionary. Add and delete the items from the dictionary and then serialize the dictionary to disk again. If that’s not clear, ask your question on Stack Overflow.